This good sized cabin shed isn’t somewhere that’s merely functional, it’s also a place that you can relax and luxuriate. The overhang at the front, under which you can sit in a deckchair or at a patio set, can be further enhanced with an optional verandah. The result is a beautiful garden building that you’ll enjoy spending time in, and which is sure to attract envious looks from your neighbours. In our climate, of course, rain is always a possibility, but we were impressed with the weatherproofing qualities that this shed comes with as standard. Firstly, there is the apex roof from which water simply bounces off or runs away. 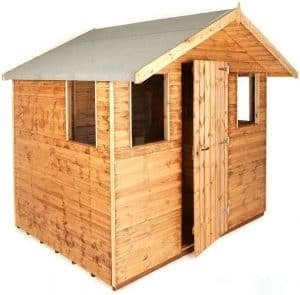 It also helps to make this cabin considerably taller than most timber sheds we review. 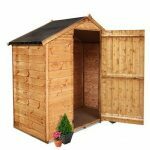 It also features high quality tongue and groove cladding, which again is excellent at keeping water out and thus preventing the appearance of rot. The four fixed windows create a pleasant interior that’s full of natural light. If you’re worried about the impact that this could have on the security of the cabin, you’ll be pleased to hear that a solid key operated lock is included as standard, which itself can act as a useful deterrent against opportune thieves. We’ve seen this apex roofed timber cabin both in its standard state, and with the optional verandah attached, and with or without the verandah it’s a very attractive garden building. 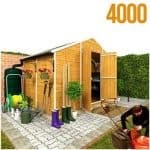 It allows you not only the benefits of having a high quality storage facility in your garden, but you can also lounge outside it and enjoy summer days and evenings. Even if it rains, the projecting roof gives you all the protection you need from the elements. The felt covered apex roof does the same for the contents of the cabin as well; it keeps them dry by causing rain to slide away. It also makes this shed very tall, and this was one of the first things we noticed about it. The ridge height is 2.27m, compared to an eaves height of 1.68m. When choosing a place to position the cabin remember the overall width of 2.44m and the overall depth of 3.05m, but also remember that the manufacturer recommends that a gap of at least one foot be left on all sides. 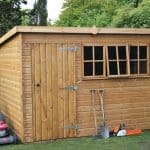 Many wooden sheds we review use thin cladding to keep the costs down, so we were pleased to see that on this occasion 12mm PAR cladding was used. That means it has superior strength and rigidity when compared to standard rough sawn cladding, and this can be felt when the cabin is erected. The standard frame is 44 X 27mm, although this can be upgraded to a heavier duty frame which will provide added stability if the verandah is added. We were very pleased to see that the same thick tongue and groove cladding has also been used for the roof and the floor, as this isn’t always the case with the sheds we review. At this price, however, we would have expected floor supports to keep ground moisture away as standard, rather than being offered as optional extras as they are here. 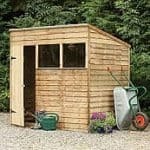 For a shed in this price range, we would have liked it to have been pressure treated and to have an extended warranty, but unfortunately none of those feature here. A basic dip treatment has been applied, but the customer is advised to apply their own treatment within six weeks of assembling the cabin. Further treatments with a good quality wood preserver are then required on an annual basis. If this is followed then rot should be prevented for many years, so it’s a pity that the manufacturer’s have only provided a basic one year warranty. The single hinged door is braced and feels strong during operation, but the most impressive thing about it is its height of 1.75m and its width of 0.76m. This is considerably taller than many single doors we see, and wider too, so you won’t have to stoop down every time you use it. With two doors at the front and one at each side, natural light really does get into every part of this shed. We were also impressed by the thickness of the horticultural glass used as glazing, which at 3mm is twice as thick as some shed windows we see. This added thickness means that it should take a concerted effort to break the windows, which can give added security against opportune shed thieves who will often seek other targets if their initial attempt is unsuccessful. An even more useful security feature, in our opinion, is the integrated key-operated lock. It’s simple to operate, and yet it can make the door to your cabin as safe as the door to your home. We’re used to seeing sheds where it’s left to the customer to buy a lock, so this was a welcome addition. We were pleased with the dimensions of the single door, but appreciate that some people will need a wider opening to move objects such as bicycles or fishing equipment in and out without too much manoeuvring. That’s why it was good to see that there was an option to have doubled hinged doors rather than a single one, giving an overall opening of three and a half feet. Other options relate to the windows. The cabin can be supplied fully boarded and window free, which will greatly boost security and privacy. Alternatively, there is the option to change one or more fixed window into an opening window, allowing air to circulate through the cabin. With other options including the addition of either a 2’6 or 4’ verandah, we were pleased to see that this is one garden building that really gives the customer what they want. Upon inspection of the frame, it becomes apparent that the corners are chamfered to give extra strength. It’s little things like this which show the high quality that has gone into this cabin. We are pleased that superior quality PAR cladding has been used for all the exterior surfaces, but would be a little concerned about the potential effect of ground moisture unless optional floor bearers are used. 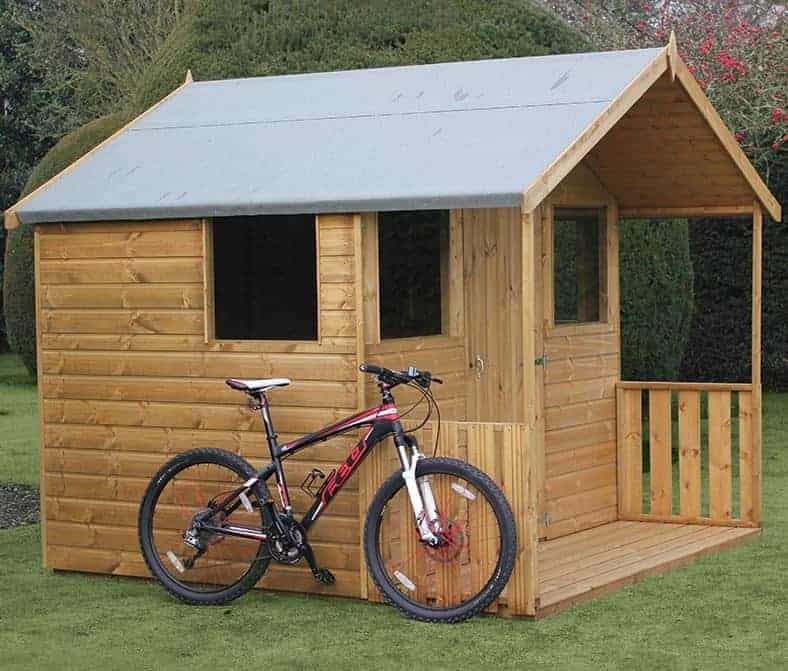 The overhang not only provides a perfect place to sit in nice weather, it also gives the shed a much larger feel. Even so, the interior volume is enough to hold a large amount of tools and equipment. 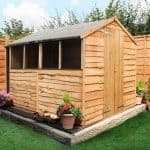 There are lots of components to this shed, so although we feel that two people should be able to install it in around five or six hours, we can imagine many customers taking advantage of the reasonably priced professional installation service. For a storage shed and an attractive cabin in which to relax in front of, this is good value for money, but it’s a pity that a longer warranty period wasn’t included. 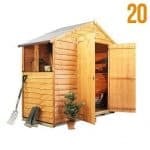 Final Thoughts: Sometimes it’s the luxurious touches that make life so enjoyable, and this timber cabin adds a luxurious touch of class to any garden for less than eight hundred and fifty pounds. We particularly like the look of this shed when it has the optional long verandah added, and if you have children or grandchildren they’re sure to appreciate that too. Even in its basic form, the overhang creates a porch where you can sit or stand protected from the elements. With security inbuilt, thanks to the key operated lock, and high quality cladding keeping water out, this is a cabin that comes with added peace of mind.